Most refrigerator parts needed can be picked up locally; if we cannot get the refrigerator parts in Oak Park IL then they must be specially ordered in. So, specify your make and model of refrigerator when calling in with the initial request so we are as educated and qualified as possible. The easier it is to find the reason behind your problem, the faster we will be out of your hair. Further, we accommodate businesses in the Oak Park IL area that need emergency repairs for their commercial fridges (and other appliances) and we understand the importance of urgency. In fact, we even have landlords calling us when their tenants are in need -- again, nothing is more important than making sure your refrigerator repair gets handled in a timely manner. 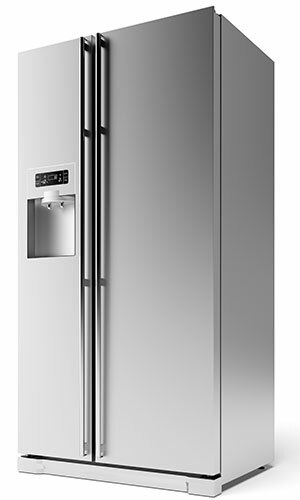 If you are in dire need of a refrigerator repair in Oak Park IL, just give us a call to discuss your fridge issues. Is your refrigerator leaking everywhere? If so, this could be caused by a blockage within the drain hose or at the drain's opening. This can happen whenever crud accumulates, or if ice jams it. Your door seal could also be broken, but this is less likely -- both are easy do-it-yourself repairs and the parts run $50 or less, so you do not have to worry. Alternatively, it could be caused by a defect in the drip pan or the water inlet valve; locate the origin of your refrigerator leak to find the problem and eventually the solution!